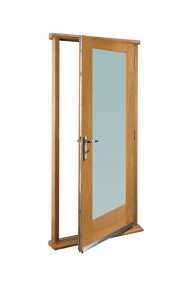 Part L compliant, factory finished and pre-hung external oak door sets are now available to order. Due to a popular demand we are bringing back the range of oak front door sets, factory pre-hung and pre-finished, delivered to the mainland UK in 3-4 weeks from order. 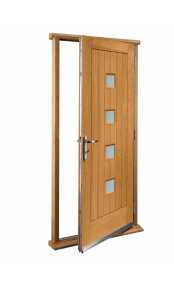 Eight of our most popular front door models now have thermally insulated cores for better energy efficiency and are offered in a complete set with door frame, ironmongery and threshold system. The ironmongery includes 5 way multipoint locking system, security hinges with studs and a pair of lever handles on both sides of a door. These pre-hung door sets are fully finished in exterior quality medium oak stain and require no preparation or finishing on site. They are delivered as fully made up units (some of the ironmongery is removed for transport), to reduce the installation process to a minimum, allowing experienced DIYers to install the door set without the need for external carpenters. All our pre-hung external door sets are FSC certified (made of timber from responsibly managed forests so having no negative impact on environment), CE marked for quality (comply with BS EN 14351-1:2006) and meet current regulations of Part L document of Building Regulations.